As her boyfriend, who is the area’s only police, begins to investigate—and finds not one but two bodies—Evelyn can’t forget that her would-be killer, Jasper Moore, was never caught. But there are no new faces in tiny Hilltop, no one who seems suspicious or potentially violent. In this twisted game of cat and mouse, Evelyn is certain of only one thing—Jasper must be hiding in plain sight. And if she can’t find him before he comes for her, she won’t be lucky enough to survive twice. Taking a break from some awards reading this week, I spied this book on my library shelf and decided to use it as a bit of a palate cleanser. I'd read Novak's novella that set up the background to her Evelyn Talbot series a couple of years ago, and although I'd been a wee bit underwhelmed by that tale, the potential of the characters and the Alaskan setting were enough for me to give this one a go. Perhaps with a full length novel Novak would have the room to thread in more layers, subtext, and depth, and remove the feeling of superficiality that had marred an interesting storyline in her novella. Unfortunately, I quickly discovered that things were much the same, just on a larger scale. All readers have their pet peeves, and FACE OFF pinged a few of mine in the first few pages, including my dislike for expository dialogue which feels unnatural and is clearly the author just trying to deliver recaps and other information to the reader. And doing so in a clunky way, 'on the nose' with no touch for subtext or subtlety. There are some 'nice bones' to this story, plenty for the author to work with when it comes to creating a really excellent, tense thriller in an interesting location, but the fleshing out of those things falls flat. It's a shame. I possibly would have been more forgiving if there hadn't been such an accumulation of clunky prose, stilted and expository dialogue, and storyline set-ups and plot leaps (even holes) that had my eyes rolling more than having me on the edge of my seat. Let me clear - this isn't a terrible book. Novak has a good underlying story and I'm sure many readers may enjoy this tale of a damaged psychiatrist still being stalked by her teenage nemesis while trying to get on with her life and delve into the nature of psychopathology in remote Alaska. For me there are just too many little things that make it meh' rather than meaningful. My early reactions probably created a bit of a snowball effect - once the obvious 'author hand' of poor dialogue and clunky prose pulled me out of the story, I wasn't as engaged and the novel didn't deliver as much emotional oomph for me that it may do for readers who aren't bothered by such things or aren't pulled out of the story. Stepping back, this third novel in the Evelyn Talbot series significantly advances both Evelyn's relationship with local cop 'Amarok' and the ongoing storyline relating to her sadistic high school boyfriend, a serial killer who left Evelyn for dead as a teenager but hasn't completely left her life. Novak does a good job setting the hook and making the reader want to turn the page and want to find out what happens to Evelyn and the Hilltop community. Despite the book hovering towards the DNF category for me at times, I persevered because I was curious. It's an easy read with some narrative drive. I just didn't care as much as I could have. Which was a shame. I kind of feel like Novak needs a stronger hand from her agent or editor, but then again perhaps this is just her writing style. And while it didn't really do it for me, taking a squiz at Good Reads, it seems plenty do love the Evelyn Talbot tales (FACE OFF has a 4.49 average from more than 1,200 ratings, whereas Jane Harper's sublime THE DRY, one of my top reads of the past couple of years, only has a 4.07 average). 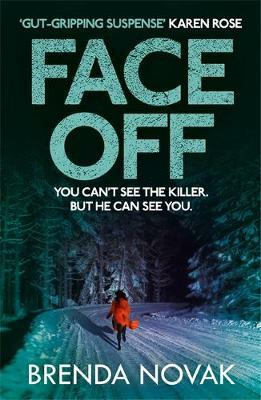 So while FACE OFF wasn't really for me, in terms of the quality crime writing I'm looking for, it was an at-times interesting diversion and I think it could be the kind of book that some crime readers will really enjoy. Probably one that's more for the big fans of James Patterson and Chris Carter.